White River Division: GMD Recollections - Santa Fe All the Way. GMD Recollections - Santa Fe All the Way. The GMD 40th anniversary display included ATSF GP60 #119. The date was June 16, 1990. The GMD plant in London had a multi-track enclosure at the front (north) side of the plant that was sometimes put to use as a display area. Such was the case on June 16, 1990 on the occasion of the company's 40th anniversary. 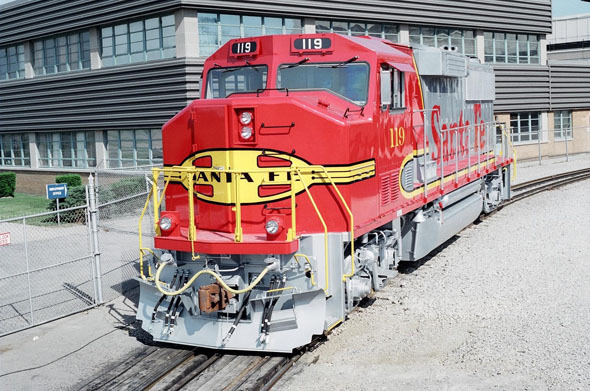 Santa Fe 119 represented the GP60 model currently in production. Other display units representative of recent production included CN SD60F #5535, built in 1989, and CP SD40-2F #9015 from 1988. Throwback Thursday - Always a Fan of the ACR. GMD Recollections - Close, But No Cigar. Throwback Thursday - Meet the Cariboo Prospector.